A huge thank you to Minted for collaboration on this post. All thoughts and opinions on my own. 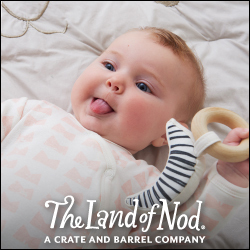 Thank you for supporting the brands that make Home Sweet Ruby possible! 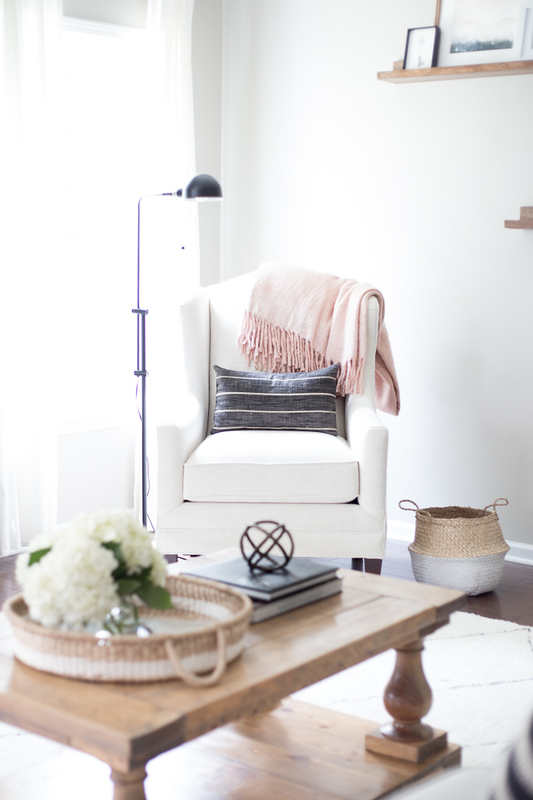 A while ago I shared plans for a little living room refresh and an updated gallery wall but then the lovely first trimester symptoms hit and delayed this project a bit. 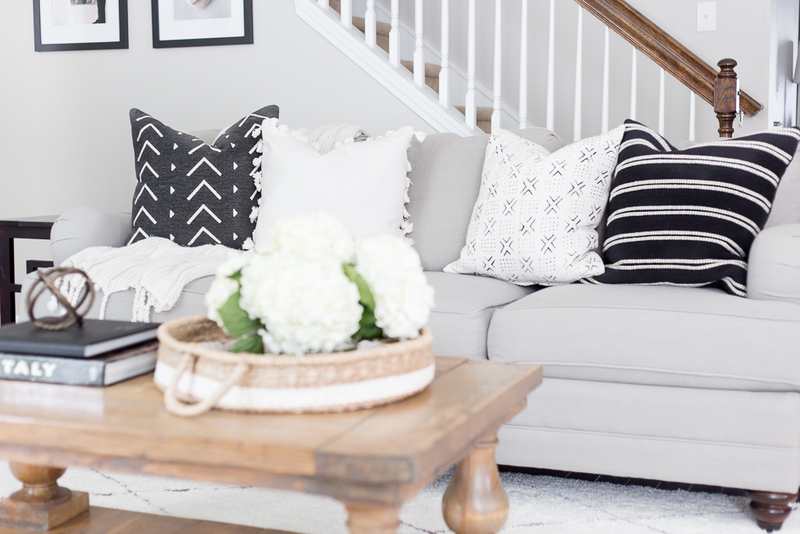 Finally I feel like we've had enough progress and I'm so incredibly happy with how much we've been able to update this space with a modern farmhouse style while staying on budget! 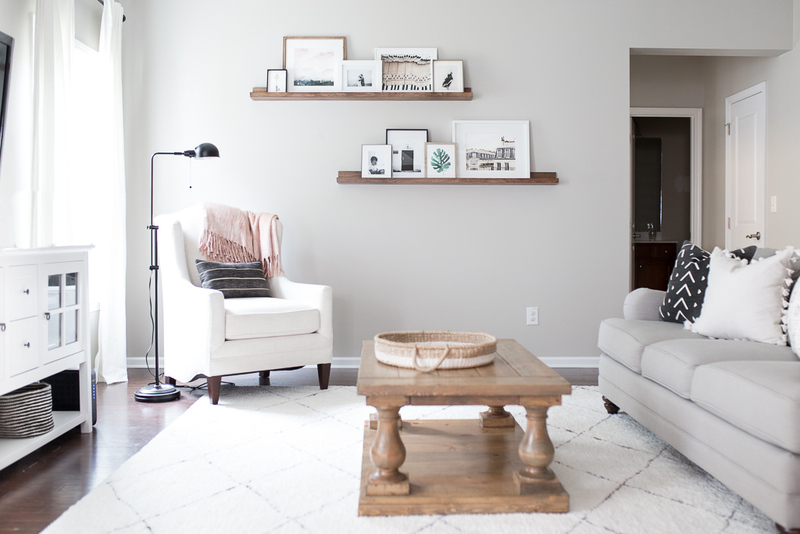 The hardest part for me was the gallery wall- I just couldn't envision it. 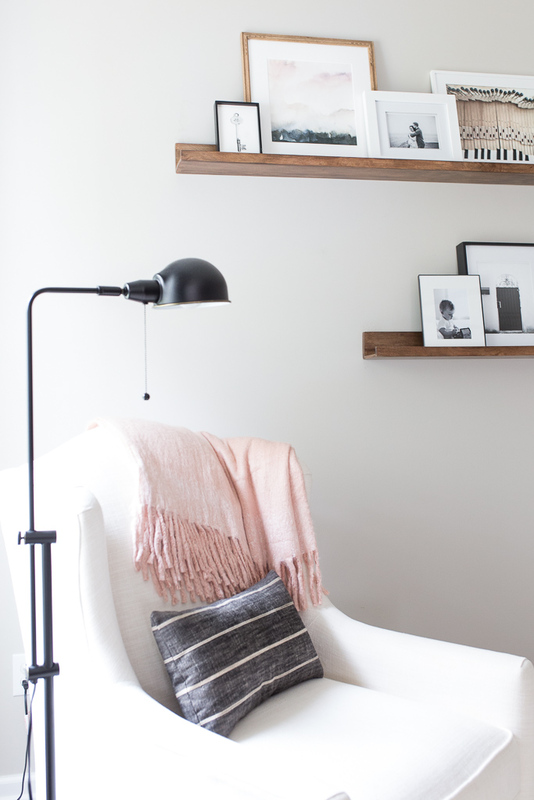 How to style the ledges and where to hang them or what types of frames would pair well together... it just wasn't coming to me. 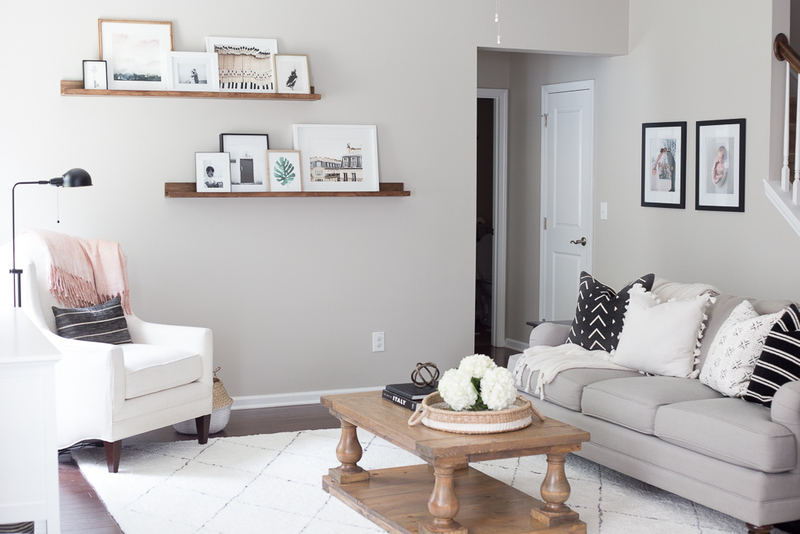 That's when I enlisted a Minted gallery wall stylist and after she worked her magic, this is what our living space looks like now! Not bad by any means but we didn't have pillows or blankets and the space needed a new (clean) rug, tv stand, and some lighting. 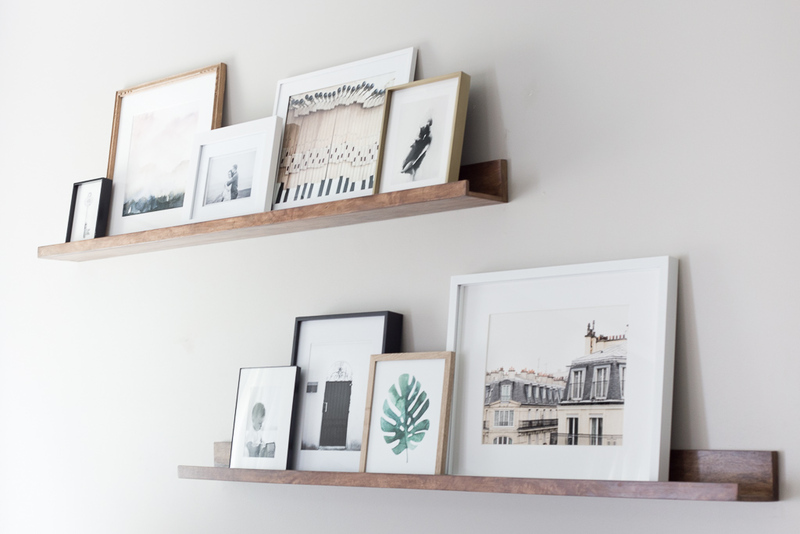 I also really wanted to modernize the gallery wall with some ledges while mixing art with family photos in a variety of frames. There are slight differences in the gallery wall framing and artwork, because working with a budget meant I couldn't spring for every single piece in the stylists' plans. But I feel like we came really close! 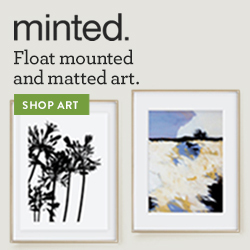 I absolutely love Minted's frames- we are using 3 on the top ledge (the black, wood, and champagne frames) and I highly recommend getting your Minted art framed if its in the budget. The quality is just so good and its so much easier than trying to search for frames elsewhere! Plus, the float mount option is beautiful!! The Mother's Embrace artwork is my absolute favorite but I also love how the abstract pulls out some blush tones to add to the neutral gallery wall. I added a bunch of pillows with a mix of prints, which definitely makes the couch more inviting and ties everything together better. 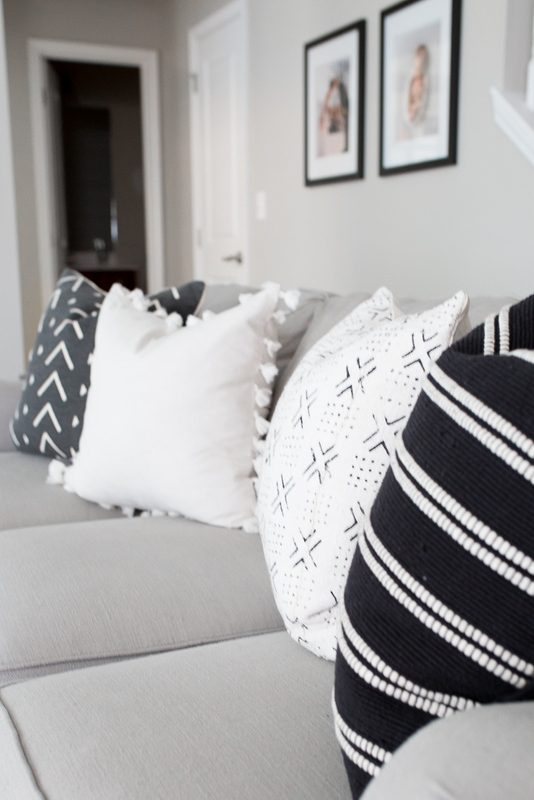 Most of them are sold out now, except for this Maewoven pillow, but I love this similar pom pom one and this tassel pillow! I should note this space rarely looks this clean... but it has been nice that Rowan started leaving coffee table decor alone lately! So not a huge difference but I feel like this space definitely looks more put together! Plus a clean white rug, minus pet and toddler stains (so far... knock on wood), always helps! I still have a bit of styling left to do (honestly not sure what the heck to put on the tv stand... maybe you guys can helps with that!) and I want to get bamboo blinds for the windows, but other than that I think this space has come a long way! It really did turn out great!! Love the new look!! Loving that pink blanket and the ledges look so great! Love love love! And how amazing that they have stylists. I would definitely take advantage of that! 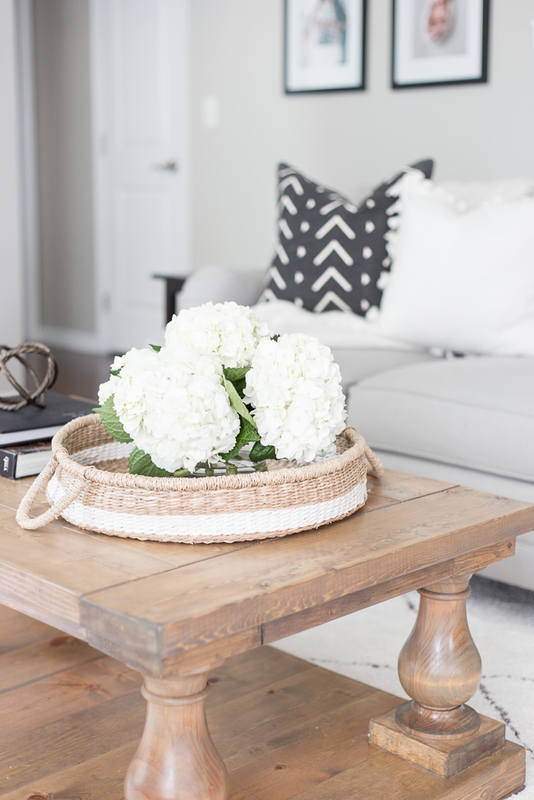 It really looks great - your coffee table is such a stand out piece - and the whole room has such a comfortable, chic feel. Great job! I LOVE the shelf! It looks so good! The before certainly isn't bad, but the after looks so put together and great!